It’s your last chance to check out the bit We Burn show in Wicker Park this weekend! This Saturday should be amazing with a great closing party followed by the Oh Gawd It Burns after party. Just wanted to remind everyone about the upcoming First Friday show, this Friday, featuring We Burn. This is looking to be a great show, and my only lament is not being able to be there in person to see it all go down. Some of my work will be though, alongside many other talented artists. If you’re in the Chicago area, you’ve really got to check it out. The Flat Iron Building is at 1579 N. Milwaukee Ave, Chicago, IL. No April foolin’! The opening will run from 6-10pm this Friday, April 1st, and there will be a party at the closing on the 16th as well. You don’t want to miss this. Of my own work, I am featuring six paintings this time. Others will be showing not only paintings, but also photography, sculpture, I believe we’re even going to have a Chiditerod shopping cart in the mix. I can’t recommend enough that you come out. Well, I’m back from the International Anaplastology Association Conference in sunny Sarasota, Florida now. It was a lovely event, and so great to get to meet so many people working in anaplastology and hear their stories and what they’re up to. We also teamed up with the International Symposium of Bone Conduction Hearing-Craniofacial Osseointegration this time, so there was a bit of a crash course for many of us in the details of bone conduction hearing aides, though most of the lectures remained separate. The first day, some were busy taking certification exams for anaplastology. I haven’t done this myself, nor am I even close to being qualified to take them (it takes 18 cases, handled solely start to finish, and photo documented along the way), but it seemed like those who did were relieved to be done afterward. And what better way to relax after a test like that, or get to meet people for the first time if you’re like me and only just got there, than to have everyone out to the hotel’s beach house for a meet and greet get together with drinks, hors d’oeuvres, a little music, and a positively stellar view of the sunset. Then bright and early Thursday morning, we kicked off the lectures with an opening ceremony followed by our first two invited lecturers, Barbara Boyan, and Anders Tjellström. Barbara spoke on “Cell-Material Interactions: What They Mean Clinically,” and Anders spoke on “The Evolution of Titanium Implants.” After that, we broke into anaplastology specific lectures and bone-conduction hearing lectures, with workshops happening at the same time in other rooms. Personally, I stuck with the anaplastology lectures all day Thursday, and again on Friday morning. There was a great deal of emphasis throughout these lectures on matters of surgical success in the placement of implants with regard to both the osseointegration of the implants into bone, as well as the peri-abutment tissue, and avoiding skin reactions there. There was also a lot of talk about measurement and new technology for dealing with 3D forms as we do. Then Friday afternoon, I attended my first of the workshops offered. It was David Trainer’s “Mold Making: Materials and Techniques,” wherein he went over the use of some different materials he’s worked with to make sturdier, lighter, and yet very detailed molds. I know I’d like to give some of those materials a test drive myself. After his workshop, came another workshop in “Color Science and Acuity in Anaplastology.” This one, I believe was put together by Paul Tanner, but then presented by Art Schmehling of X-Rite. He spoke of various color systems, and how lighting affects color. He brought attention to the inherent weaknesses we share of being able to remember colors with precision, and our susceptibility to color fatigue. One interesting recommendation he had was to keep a space in the room where you see a patient for color matching painted a good neutral gray so that your color matching isn’t compromised by the surrounding environment. He also mentioned briefly a bit about metalics and how they affect perceived depth. I don’t believe that I’ve written about it here, but I’ve been mulling over some ideas about metalics in silicone for the last couple weeks. So after the workshop, I was really excited to get to ask a few questions of a bona fide color expert about my thoughts there. Saturday we only had a half day there. We began with two more invited speakers as per our usual program openers. Ichiro Nishimura’s “Systems Biology and Genetic Networks of Osseointegration” lecture was particularly interesting I thought. He told us about his work at UCLA, and it sounds like they are finding a connection between vitamin D deficiency and osseointegration failure. I’d never heard of that before, but if you type in vitamin d, and osseointegration into Google, you get a lot of links from research being done in this direction. You also get some information about a circadian rhythm connection, which he brought up as well. I won’t even attempt to try to tackle explaining his work in any depth here, but I would recommend that you look for it if you are interested. And then the conference wrapped up with one last round, for which I chose to go back to the workshop room again, and hear a panel discussion on “Creative Problem Solving for Challenging Craniofacial Cases,” featuring Julie Jordan Brown, Gillian Duncan, Susan Habakuk, and Greg Gion (who started the clinic where I am presently interning.) This was a nice opportunity to listen to the kinds of strategies more experienced anaplastologists have taken with their more complicated cases. All in all, it was a very educational event, and a great opportunity to meet people and better understand the whole of the anaplastology field. I’m so glad that I went. Taking in the International Association of Anaplastology’s annual conference in Sarasota Florida this week. Yeah…. life could be rougher. I’ll tell ya more when I get back. WHAT: The closing party features an artists’ reception, live music & video, performance art, and other spontaneous creative fun. A $10 suggested donation at the door goes to BURN NFP. WHY: Come explore, play, learn, smile, and take home a little Burning Man! We Burn: Chicago Burning Man Art is a multimedia exploration of the impact the Burning Man festival has on Chicago artist-participants. WHEN: The show opens as part of Flat Iron First Fridays on April 1, 2011 from 6pm – 10pm. The closing party and artists’ reception is April 16 from 6pm – 10pm. The show runs from April 1 – 16. HOW: Through photography, sculpture, video, works on paper, paintings, mixed media, installations, and performances, the community will get a feel for what it means to define oneself as a “burner,” and how the Burning Man principles of radical inclusion, self-expression, civic responsibility, leave no (environmental) trace, radical self-reliance, and active participation are carried over into art works and daily life in Chicago. This show is made possible with generous support from Bold Urban Renaissance Network. This coming week marks the 2010 Armitage Lecture series at UIC. Last year we had special guest speaker, David Bolinsky talking about his career and in particular his recent work on The Inner Life of a Cell. This year, we have special guest speaker Jane Hurd of Hurd Studios. I had the pleasure of meeting Jane last summer at the 2010 AMI Conference where she was named president-elect of the association. She seemed really cool, and I look forward to hearing more from her this week at our lecture series. Last week we had the 2009 Armitage Lecture Series at UIC. Thursday’s speakers were Noah Lowenthal, Greg Blew, and David Bolinsky. Friday we heard Edmond Alexander and Dr. Luc Renambot. And of course, special guest Frank Armitage was there. The lectures largely addressed medical animation, the business side of medical art, and the Disney influence (particularly Frank’s influence) on so many medical artists today. I think what I got out of the lectures most of all, was the importance of following one’s vision, and the potential for carving out one’s own niche. These are important lessons, though they are easier said than followed. I have posted photos from Thursday’s lectures here. Many thanks to program director Scott Barrows for making this lecture series happen. It is an annual event, and if you find yourself in Chicago next fall, you might think of looking into making it by UIC for the next round. Local Event Happening Now in Chicago! Today kicks off the 64th Annual Conference for the association of medical illustrators. This year’s conference takes place at the Omni Hotel in Richmond Virginia, and right this moment, many a travel wary artist is getting a bit of rest before the workshops and presentations begin. Last night I had the rare privilege of seeing a few of artist Dave McKean’s works up close and first hand followed by live performances and a screening of the 1929 silent film classic, Faust. 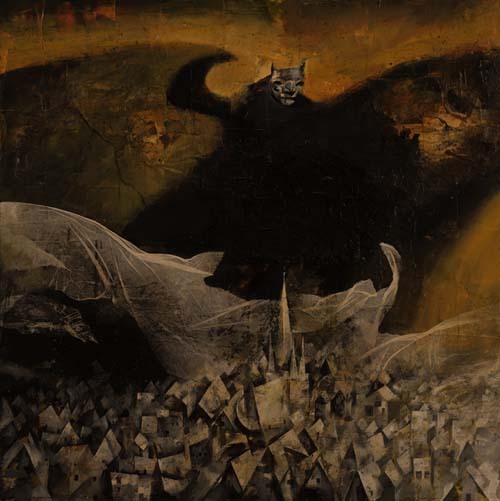 I had first discovered Dave McKean in my highschool years through his collaborations with Neil Gaiman. Then he wrote Cages, and there was just something about it. I couldn’t synopsize that story for you now if I tried, but even not having looked at it in over a decade, there are pieces of it that continue to stick with me. When I shook his hand last night, I asked him if he would speak a bit about his process. As it turned out, his time at the microphone was short, but what he did speak of was inspiration. He spoke of being inspired by these old early films. And in some ways, I think that was a better answer. Process always begins with inspiration. You can see here, the original film image of the devil taking the village, and then McKean’s take on it. Now I had gone to this event last night looking to be inspired in mixed-media work. I went with a head swimming with thoughts about what one medium can bring to another and how I could use different kinds of skills together in my own work. But what I found instead, was inspiration in how powerful appreciation alone can be. And maybe this whole idea of mixing mediums to create something new really begins with looking at more kinds of art. The works I saw last night were not anatomical or scientific in nature. They were, on the contrary, works of expression. But perhaps there are lessons to be learned here that can be utilized in other kinds of art. So I guess the thought I leave you all with, is to remember your inspirations, whatever they may be.